In the infinite flow of time and space, a stray spaceship seems to reach its journey’s end. Unfortunately, a system lock temporarily turn off motor function and unlock the big door. In trying to fix the fault, the young Star Girl loses three precious cups filled of life, and hope. The damage is done but not irreversible, but the Star Girl collapses, yielding. Empty of hope and waiting for some terrible fate that will never touch her. She is saved, not doomed. But she does not know that the two cups resting on her, are in fact filled with a new life-source, which allows her to survive the journey, still long and full of adventures, for her. 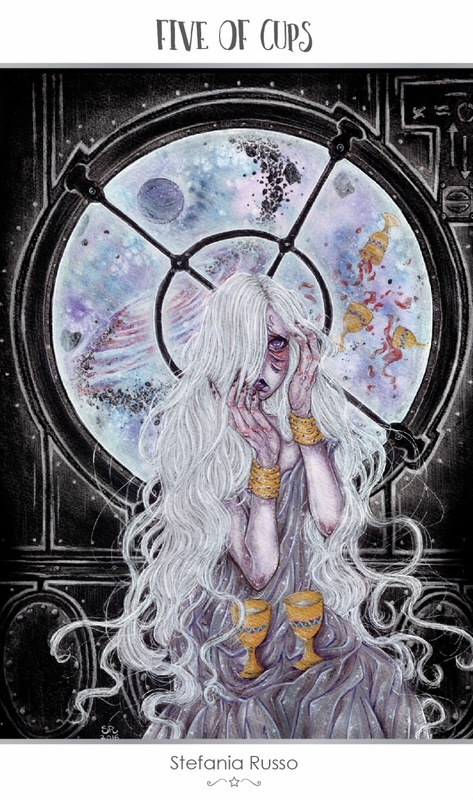 The Star Girl will continue to look outwards, in search of a solution that she has already in her hands. When this card appears in a reading, it is suggesting it’s time to be gentle with yourself. Loss is weighing heavy on you, regret feeling like a tangible presence for you right now. It’s hard to see anything but that loss at the moment. In fact, you’re currently so focused on what you’ve lost that you’re not seeing what’s right before you. Not all the cups are gone, there are still some waiting for you. Your world is not only full of despair, but joy and hope as well. There is still enjoyment, desire, love and happiness to be felt in the world. But it’s not easy for you to see right now. Rather than getting too bogged down in the loss, focus on small joys for now, as you heal. Force yourself at times to list the good things in life, at times when darkness threatens to overcome you. When you’ve had time to heal, it will get easier for you and those small joys will slowly become greater as you get through this. This entry was posted in Artist, Deck Review, Featured Card of the Day, General Tarot, Readings and tagged 5 of Cups, 78 Tarot, Astral, Tarot.